(Above, left) Archives/Navy Memorial Metro station, whose street-level escalators are still open to the elements. 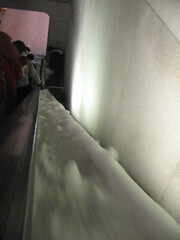 Falling snow was forming a slushy wet glacier which crept down the handrail and gathered in a pile at the bottom of the escalator. 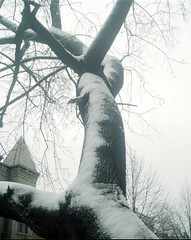 (Above, right) The next morning, a fast-thawing layer of snow on a tree near Dupont Circle.